Byron Katie certainly has achieved a revolutionary groundbreaking approach called “The Work” which digs into our thinking patterns, our surge of daily self-chatter and the impact these have on our emotions, actions, behaviour and attitude in a very unique and transformative way. 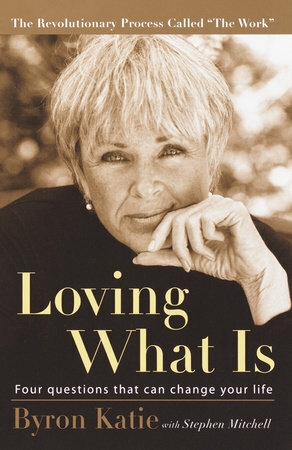 It is truly inspiring and still feels like somewhat of a mystery and a miracle how Byron Katie’s own depressing and desperate thoughts vanished overnight. She woke up one morning with a fundamental and groundbreaking shift of new realisations and new thoughts which ultimately set her free in a liberating and joyous way. It is through her own personal transformational journey of discovery from what I could best describe one extreme to the other, the latter part of finding, living and experiencing joy that has never left her is ultimately what created the discovery of “The Work” and “Loving What Is”. The purpose of the book is to provide a simple and clear-cut tool in the form of four questions that ultimately can potentially change your life. That is if you are prepared and open to leaning into Byron Katie’s “Work”. It’s a new way to self-discover and self-examine your thoughts and the significance you attach to them. If you are prepared to do an honest deep dive below the surface with your thoughts and explore the root cause of where your thoughts are not serving you in the best possible way, but instead causing you pain, suffering, anger, hurt, resentment, replaying of daily mind-boggling destructive thoughts/conservations with yourself and others, situations that you allow to pick away at you etc…. then you may just discover a reality check in doing “The Work” that can free and release you in the same way Bryon Katie set herself free. The book illustrates throughout many real-life examples where Bryon Katie does “The Work” on people from all walks of life dealing with all different types of situations affecting people, anything from the day to day irritations to the bigger more serious matters that one encounters. To quote Bryon Katie “The Work is merely four questions; it’s not even a thing. It has no motive, no strings. It’s nothing without your answers. These four questions will join any program you’ve got and enhance it. If you have no religion, they will bring you joy. And they’ll burn up anything that isn’t true for you. They will burn through to the reality that has always been waiting”. In a nutshell, if you want to experience more joy and sense of freedom from thoughts that may be corrupting your mind then you have got to be prepared to take out a pen and paper and do “The Work” as Bryon Katie guides you through it diligently. I strongly recommend to keep an open mind and be patient with “The Work” and with yourself in doing it. Bryon Katie as an author delivery the book with the refreshing honesty of her own experiences, combined with eloquence on the one hand and sheer razor-sharp reality checks on the other hand while guiding with the intent for you to learn, grown and experience the amazing freedom that she lives with in her daily life. Flying without Wings – Everything is Possible!